Penney writes that he was glad to hear from Miss Berry's letter that his foundation's $150 gift came at a time when it was really needed. He writes that he and Mrs. Penney will not be in Florida when Miss Berry visits his farm that winter, but that he will have Dr. Walter Morton host her at Penney Farms. Miss Winifred Root encloses a "small" check to commemorate the date of President Hoover's election after she heard about the success of the Berry Schools from two friends, Mrs. Hammond and Miss Crystal Waters. 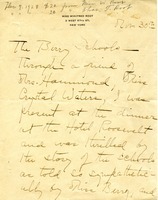 Miss Root's letter is sent from 2 West 67th St., New York, NY.